Crack Cocaine is the more pure form of Cocaine. It is similar to cocaine in that it comes from the coca plant and is classified as a stimulant. 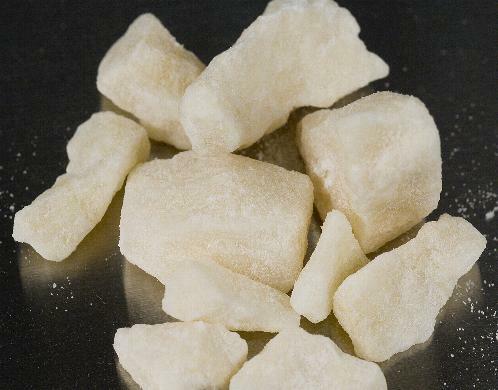 Crack comes in small blocks resembling soap and varies in color from yellowish to white. Crack is most often smoked and got it's name from the crackling sound it makes when being smoked. Because powder cocaine is usually high in price Crack is a much cheaper alternative. Other names Crack is found to be called are: Apple Jacks, Badrock, Ball, Base, Candy, Cloud, Crumbs, Dice, Hard Ball, Raw, Rock(s) & Rox. loss of appetite, increased heart rate, increased blood pressure, contracted blood vessels, dilated pupils, nausea, bizarre and sometimes violent behavior, hallucinations, the feeling of bugs crawling under the skin, anxiety and paranoia, intense euphoria, depression, convulsions, seizures and craving. damage (permanent) to blood vessels of ear and brain, heart attack & stroke, liver, kidney & lung damage, chest pains, respiratory failure, infectious diseases, weight loss, tooth decay, sexual problems, disorientation, mood disturbances, psychosis, tolerance & addiction.